I wrote a four-part series about how governments are waging a war against cash, with the first two columns looking at why politicians are so interested in taking this radical step. In Part I, I looked at the argument that cash should be banned or restricted so governments could more easily collect additional tax revenue. In Part II, I reviewed the argument that cash should be curtailed so that governments could more easily impose Keynesian-style monetary policy. Part III and Part IV are also worth reading, though I confess you’ll just get additional evidence to bolster what I wrote in the first two columns. Today, let’s look at a real-world example of what happens when a government seeks to curtail cash. It happened in India last November, and I wrote about the disruption that was caused when the government banned certain notes. But maybe the short-run costs were acceptable because there are long-run benefits. That’s certainly possible, but the evidence suggests that the Indian government is doing long-run damage. Derek Scissors of the American Enterprise Institute has a new column on what’s happening with India’s economy. He is not impressed. There is certainly a long-standing and extensive corruption problem. The discussion of “black money” has become so absurd, however, that it has little relation to corruption. …Taking currency notes out of circulation in a surprise move late last year was said to target black money inside the country. Seizure of cash was justified by a huge amount of hidden funds. …For political reasons, black money is being wildly exaggerated as an economic issue. …Directly related to hoping there is trillions in black money is wanting to tax those mythical trillions. All governments chase revenue but India’s pursuit seems especially misguided. …Good policy enhances competition and individual economic rights for the sake of greater productivity and personal income. Being obsessed with black money, tax revenue, and GDP growth does nothing to enhance competition or individual rights and leaves ordinary Indians worse off. India’s central bank is even more critical, bluntly stating that the plan failed, as reported by the BBC. Indians returned almost all of the high-currency notes banned in last year’s shock government crackdown on illegal cash, the central bank says. It said 15.28tn rupees ($242bn) – or 99% – of the money had made its way back into the banking system. Ministers had hoped the move would make it difficult for hoarders of undeclared wealth to exchange it for legal tender. The news that it did not will raise questions about the policy, which brought chaotic scenes across India. …Many low-income Indians, traders and ordinary savers who rely on the cash economy were badly hit. …As per the RBI data, it’s safe to say that demonetisation has been a failure of epic proportions. …Agriculture, the rural economy and property – which rely largely on cash transactions – were sectors hit by the ban. It also contributed to a slowdown in economic growth. Indeed, the former head of the central bank warned the government ahead of time that the plan wouldn’t work. Here are some details from a Bloomberg story. Raghuram Rajan was governor of the Reserve Bank of India in February 2016, when he was asked by the government for his views on demonetization… “Although there may be long-term benefits, I felt the likely short-term economic costs would outweigh them, and felt there were potentially better alternatives to achieve the main goals,” he wrote in the book. “I made these views known in no uncertain terms.” …speculation has raged over who thought up the policy, with the debate getting more divisive last week as a slew of data showed demonetization contributed to a growth slump without meeting its targets. …the cash ban devastated small businesses. More than 1.5 million jobs were said to be lost and newspapers reported deaths linked to the decision. Rajan correctly observed that the best way to boost tax compliance is with low tax rates. “It’s not that easy to flush out the black money,” Rajan had said, using the local term for cash stashed away illegally to avoid tax. He added that he’d rather focus on the incentives for black money, such as tax rates. Amen. This is a point I’ve made over and over and over and over again. Meanwhile, the Indian Express also has a column, written by a former Chief Economist at the World Bank, on how demonetization has been a failure. …a wealth of analysis and data have become available. Demonetisation’s half-anniversary is a good time to take stock of this historic decision. The verdict is clear. It was a monetary policy blunder. It achieved next to nothing, and inflicted a large cost on the poor and the informal sector. …demonetisation took the wind out of India’s sails. My calculation is that around 1.5 percentage points of growth were lost to it. A column in the Harvard Business Review pours cold water on the notion that demonetization is an effective way of reducing corruption. The original reason given for the drastic demonetization action was to expose the so-called “black” market, fueled by money that is illegally gained and undeclared for tax purposes. …banks were estimated to have received 14.97 trillion rupees (around $220 billion) by the December 30 deadline, or 97% of the 15.4 trillion rupees’ worth of currency demonetized. …These rates of deposits defied expectations that vast troves of undeclared wealth would not find their way back to the banks and that black marketeers would lose this money since they would not be able to deposit their undeclared cash without being found out. This didn’t happen. It probably “didn’t happen” because the government was wildly wrong when it claimed that cash was the problem. …when corrupt people need places to park their ill-gotten gains, cash normally is not at the top of their list. Only a tiny proportion of undeclared wealth is held in cash. In an analysis of income-tax probes, the highest level of illegal money detection in India was found to be in 2015–2016, and the cash component was only about 6%. The remaining was invested in business, stocks, real estate, jewelry, or “benami” assets, which are bought in someone else’s name. 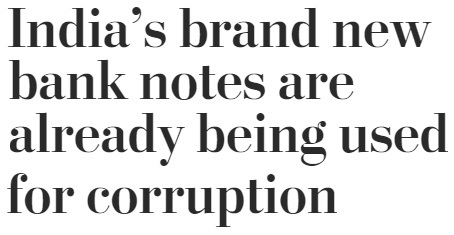 Indeed, the Washington Post reports that the new notes already are being used for illegal purposes. For the first few weeks of demonetization, it was common to meet Indians who felt that their collective suffering and inconvenience was justified because it would ultimately usher in a less corrupt, more equal India. But as the initiative enters its second month, more and more reports are emerging of seizures of vast quantities of hoarded cash in the new notes. Like water reaching the sea, the corrupt, it seems, have found ways to navigate around the government’s new obstacles. …A sense is building that while millions of Indians languish in ATM lines, the old black money system is simply restarting itself with the new notes. The real story is that the corruption is caused by government, not cash. The biggest question is how people are getting their hands on such huge stashes of the new currency. …one way: visiting your local politician. What’s especially disappointing is that the United States government took money from American taxpayers and used those funds to encourage India’s failed policy. And here are some excerpts from a report by the Hindu. It’s worth pointing out that the U.S. government was encouraging India’s bad policy during the waning days of the Obama Administration, so it’s possible that taxpayers no longer will be funding bad policy now that Trump is in the White House. P.S. The Indian government also is hurting the nation – and poor people – with a value-added tax. Bloomberg has a report on some of the misery. Before Prime Minister Narendra Modi introduced the country’s new goods and services tax on July 1, Ansari said he was earning 6,000 rupees ($93) a day selling leather jackets, wallets, bags and belts. But India’s new tax classified leather products as luxury items and raised the rate to 28 percent — more than double the 13.5 percent tax levied until June 30. Since then, his business has collapsed. “My business is down nearly 75 percent,” Ansari said… India’s vast informal economy — which accounts for more than 90 percent of the workforce — is struggling under India’s new tax rates…broader pain being felt by many small-and-medium-sized businesses in India’s informal sector, said K.E. Raghunathan, president of the All India Manufacturers Organisation. The bottom line is that India needs more economic liberty, building on some good reforms in the 1990s. Unfortunately, politicians today are delivering bigger government. P.P.S. If you want to read about some symptoms of India’s bloated government, the country has a member in the Bureaucrat Hall of Fame, it also produced the most horrifying example of how handouts create bad incentives, and it mistreats private schools to compensate for the wretched failure of government schools. P.P.P.S. Here’s a very powerful factoid. America has many immigrant populations that earn above-average incomes. But, by far, Indian-Americans are the most successful. Just imagine, then, how fast India would grow and how rich the people would be with Hong Kong-style economic liberty? Anyone who thinks the war on cash (and now cryptos) is about stopping crime and terrorism is a few fries short of a happy meal. The operative word is CONTROL. An excellent piece without a comment somehow looks naked, like a sun without any planets. So I’ll say it: excellent piece. Specialisation and exchange is what makes the world far richer than if every community was self-sufficient, and that exchange needs a medium, and for a few weeks Modi took cash exchange away from the people who find it the most convenient.